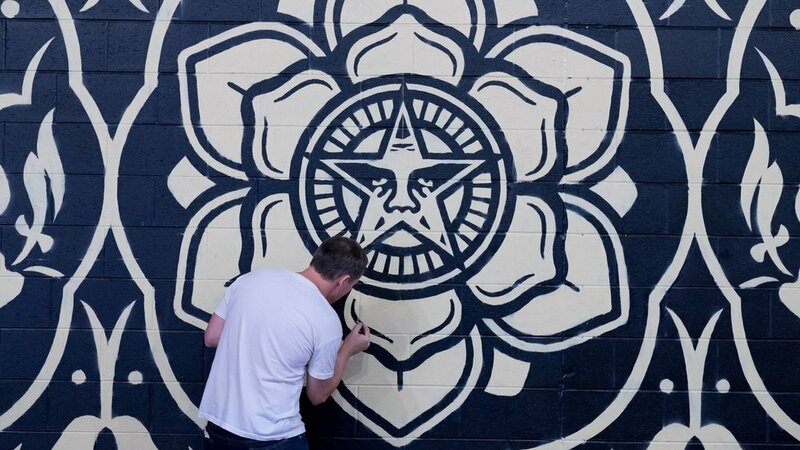 Shepard Fairey's work and practice disrupts the distinction between fine and commercial art. He has become widely known since the 2008 US presidential election for his Barack Obama “Hope” and Inauguration poster that hangs at the National Portrait Gallery in Washington DC. Fairey rose to prominence in the early 1990s, through the dispersion of posters and stickers that were labeled as “Andre the Giant has a Posse” which would later relate to his Obey Giant Campaign. Today the work is now regarded as an international phenomenon, having changed the language between art and the urban landscape. Fairey sits on the advisory board of ‘Reaching to Embrace the Arts’, a nonprofit organization that provides art supplies to priority schools; and in 2007, he joined the board of the ‘Music Is Revolution Foundation’, a nonprofit organization that supports music education for public schools and for which he created a logo. In 2014, Fairey painted a towering mural paying tribute to Nelson Mandela and the 25th anniversary of the Purple Rain Protest in Johannesburg, overlooking the Nelson Mandela Bridge. He has always been open about controversial social and political topics, and often creates or donates artwork in order to promote awareness for various social issues.